The Beatles at Thomson House, London. 28 July 1968. © Apple Corps Ltd.
On November 9, Apple Corps will release a 50th anniversary version of The Beatles’ 1968 ‘White Album.’ The album’s original 30 tracks are newly mixed by producer Giles Martin and mix engineer Sam Okell in stereo and 5.1 surround audio, joined by 27 early acoustic demos and 50 session takes, most of which are previously unreleased in any form. Categories: Anniversary, Beatles News, New Beatles merchandise | Tags: 50th anniversary, beatles, beatles cd, beatles vinyl, beatles white album, cd release, deluxe edition, the beatles, unreleased recordings, white album | Permalink. On May 26, The Beatles will release a new remixed version of their groundbreaking Sgt. Pepper’s Lonely Hearts Club Band album on CD and vinyl, and this 50th anniversary edition is a vibrant achievement. Giles Martin and Sam Okell took the original master tapes from the classic 1967 Beatles album and enhanced the sound to bring it up to date to the stereo standards of the 21st century. Mixed in stereo and 5.1 surround audio, this is a vast improvement over the 2009 remastered Beatles CD version. This is the first time the album has been remixed. The original four-track session tapes were the source and Giles Martin used the original mono mix produced by his father, Beatles producer George Martin, as a guide. When comparing the 2009 remastered Sgt. Pepper CD to the remixed 2017 version, it’s like going from black and white to color. The 2009 remastered version almost sounds muted when compared to the 50th anniversary remix due to the fact that the sound of the vocals, guitars and drums are all brought to the front. The remixed Sgt. Pepper CD is definitely worth getting, no matter how many previous versions you have. While you can just get the remixed CD by itself, here’s why you should get the Super Deluxe edition. If you love to hear outtakes and get a glimpse into how The Beatles’ song process took place, you’ll especially enjoy Disc 2 of the Deluxe package. Here you get 18 tracks including five takes of “Strawberry Fields Forever” and five takes of “A Day in the Life.” These outtakes include an alternate attempt at creating the dramatic piano sound at the end of “A Day in the Life”, instead with all of The Beatles humming in unison. Note that Disc 2 on the Super Deluxe version is different from the outtakes included on Disc 2 of the 2-CD Deluxe set. If you are not that interested in outtakes, the Super Deluxe package is still worth the money because of the lavish hardcover book and The Making of Sgt. Pepper documentary on DVD and Blu-ray. The Making of Sgt. Pepper documentary was made for the 25th anniversary of the album’s release and contains great interviews with Paul, George, Ringo and George Martin. The highlight is watching George Martin sit at the engineering controls in the recording studio and isolate either the vocal or instrumental tracks on several of the songs and discuss The Beatles’ recording process. The six-disc Super Deluxe set comes with a 144-page hardcover book the size of an album. The book includes chapters written by different writers on various aspects of the album. Topics include the design of the cover, the album’s musical innovations and its historical context by Beatles historian, author and radio producer Kevin Howlett; composer and musicologist Howard Goodall; music producer and writer Joe Boyd; and journalists Ed Vulliamy and Jeff Slate. The book also features rare photographs, reproductions of handwritten lyrics, Abbey Road Studios documentation, and original ‘Sgt. Pepper‘ print ads. Last but not least, there is a complete list of every person featured on the Sgt. Pepper cover. You could spend hours and hours looking at that. Take your time and savor every aspect of the Sgt. Pepper 50th anniversary Deluxe edition. By the time you get through it all, the new White Album reissue project will be ready! Get our FREE playlist of lesser-known Beatles songs when you sign up for the Daytrippin’ Beatles newsletter: go here to subscribe. Categories: Anniversary, New Beatles merchandise, Reviews | Tags: 50th anniversary, beatles, cd release, deluxe edition, dvd release, making of sgt pepper, sgt pepper, sgt pepper 1967, sgt pepper 50, sgt pepper reissue, sgt pepper review, the beatles | Permalink. It was 50 years ago on June 1, 1967 when The Beatles surprised the world ushering in the Summer of Love with Sgt. Pepper’s Lonely Hearts Club Band, the groundbreaking masterpiece that became popular music’s most universally acclaimed album. To salute the occasion, The Beatles will release special CD and Vinyl packages of the Sgt. Pepper 50th Anniversary Edition on May 26. The album is newly mixed by Giles Martin and Sam Okell in stereo and 5.1 surround audio and expanded with early takes from the studio sessions, including 34 previously unreleased recordings. “It’s crazy to think that 50 years later we are looking back on this project with such fondness and a little bit of amazement at how four guys, a great producer and his engineers could make such a lasting piece of art,” says Paul McCartney in his newly-penned introduction for the Sgt. Pepper Anniversary Edition. “Sgt. Pepper seemed to capture the mood of that year, and it also allowed a lot of other people to kick off from there and to really go for it,” Ringo Starr recalls in the Anniversary Edition’s book. This is the first time Sgt. Pepper’s Lonely Hearts Club Band has been remixed and presented with additional session recordings. To create the new stereo and 5.1 surround audio mixes for Sgt. Pepper, producer Giles Martin and mix engineer Sam Okell worked with an expert team of engineers and audio restoration specialists at Abbey Road Studios in London. All of the Anniversary Edition releases include Martin’s new stereo mix of the album, which was sourced directly from the original four-track session tapes and guided by the original, Beatles-preferred mono mix produced by his father, George Martin. Fans have been waiting for a new stereo remix of Sgt. Pepper since the original stereo release was rushed out with no input from The Beatles. The mono version was what The Beatles and George Martin had poured their heart and soul into back in 1967. “No matter how well you know the album, this remix is full of nuances any fan will notice, especially the bottom end —Ringo’s kick drum really reveals new dimensions,” explains Rolling Stone writer, Rob Sheffield. “The alternate takes are full of discoveries; hours of new Beatle music that gives a taste of how many treasures remain in the vault. It’s not just historic value — it’s an astounding listening experience,” says Sheffield, who got an exclusive first listen to the Sgt. Pepper outtakes. The Super Deluxe set includes a 144-page hardcover book featuring new introductions by Paul McCartney and Giles Martin, and chapters covering comprehensive song-by-song details and recording information, the design of the cover, the album’s musical innovations and its historical context. The Super Deluxe edition also includes a DVD and Blu-ray featuring the previously unreleased documentary film The Making of Sgt. Pepper (broadcast in 1992), with insightful interviews with McCartney, Harrison and Starr, and in-studio footage introduced by George Martin. For Record Store Day on April 22, Apple Corps Ltd./Capitol/UMe will release an exclusive, limited edition seven-inch vinyl single of The Beatles’ “Strawberry Fields Forever” and “Penny Lane,” among the first songs recorded during the ‘Sgt. Pepper’ sessions, which began in November 1966. Categories: Anniversary, Beatles News, New Beatles merchandise | Tags: 50th anniversary, beatles, cd release, dvd release, making of sgt pepper, outtakes, Paul McCartney, remastered, ringo starr, sgt pepper, sgt pepper 50, sgt pepper reissue, the beatles | Permalink. Ringo Starr has written a new song reminiscing about his early days in Liverpool about the band he was in before he joined The Beatles. The song title, “Rory And The Hurricanes,” was announced last week along with the full track listing and release date of Ringo Starr’s new album, Postcards From Paradise. The song “Rory And The Hurricanes” coming out on March 31 will add to the musical autobiography that Starr has been creating since 2008. Instead of publishing a traditional autobiography, Ringo has chosen to write about his life through his songs. This song will continue the musical memoir that Starr started in 2008 with his song “Liverpool 8” about the good and the bad of growing up in this British working class town where he became part of The Fab Four. It was while Ringo was the drummer for Rory Storm’s band that he adopted the first name “Ringo” instead of “Richard” for all the rings he wore and “Starr” instead of “Starkey” for “Starr Time,” a portion of the show where Ringo did a major drum solo. Categories: Beatles News, New Beatles merchandise | Tags: cd release, liverpool, ringo starr, rory and the hurricanes, rory storm | Permalink. Reissues of two Wings albums, Venus and Mars and At The Speed of Sound, were released last week. Both albums are available in a variety of physical and digital formats. Starting with a 2-disc (2 CD) Standard Edition, the first CD features the original remastered album and the second CD includes bonus audio made up of material including demos and unreleased tracks. The 3-disc (2CD, 1DVD) Deluxe Edition is housed in a hardback book featuring unpublished photographs, new interviews with Paul, material from Paul’s archives and expanded track-by-track information. The deluxe version bonus DVD is comprised of filmed material from around the time of each release, some of which has never been seen before. As with all the Archive Collection, Paul McCartney has personally supervised all aspects of the reissues. The remastering work was done at Abbey Road by the same team who have worked on all the reissues as well as the Beatles’ catalogue. Since launching the Paul McCartney Archive Collection in 2010, Paul has received two GRAMMY Awards for the releases. 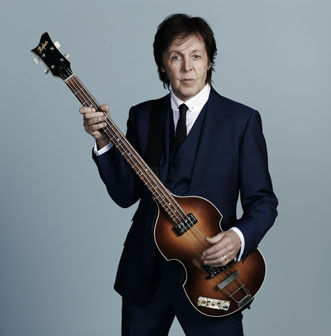 In 2012 he picked up Best Historical Album for Band on the Run and this year Wings over America picked up an award (Best Boxed or Special Edition Package) on the same night that Paul set a personal best by picking up five awards in just one night. In 2013, RAM was nominated for Best Historical Album. Other titles released to date in the Paul McCartney Archive Collection are Band on the Run, McCartney, McCartney II, RAM and Wings over America. Is your collection complete? 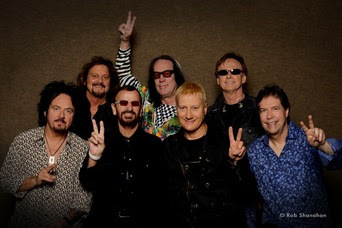 Ringo Starr and his All Starr Band – Steve Lukather, Richard Page, Gregg Rolie, Todd Rundgren, Gregg Bissonette and Warren Ham – announced new tour dates beginning on February 13 in Louisiana and then onto Texas, Birmingham, South Carolina, and Orlando before traveling throughout Latin America with shows in Puerto Rico, Dominican Republic, Brazil, Chile, Mexico and more. The tour continues through March ending with 3 shows in California in Santa Ynez, San Francisco and San Diego and a show in Las Vegas. This incarnation of the All Starr band is the same line up he has played with since 2012, and the addition of these new dates comes as no surprise to anyone who has heard Ringo talk about this band, with whom he loves performing. “We have so much fun playing together , we don’t want it to end!” Ringo also loved touring in Latin America and said “the audiences were just great and so loving, we can’t wait to go back”. Can you guess the 5 Beatles songs that Elvis Presley sang? John, Paul, George and Bob: Did The Beatles really eat at Bob’s Big Boy? Categories: Beatles News, New Beatles merchandise | Tags: at the speed of sound, cd release, concert tour, Paul McCartney, remastered, ringo starr, venus and mars, wings | Permalink. Paul McCartney has been working overtime promoting his new album called ‘New.’ In the US, he appeared on Jimmy Kimmel, Jimmy Fallon, and Howard Stern, plus he performed at the iHeartRadio Music Festival in Las Vegas, did an impromptu mini-concert in New York’s Times Square last week and a surprise concert in Queens at the Frank Sinatra School for the Performing Arts. 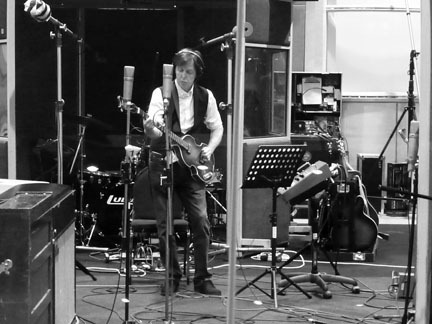 ‘New’, with a release date of October 15, is McCartney’s first album of original material in six years. With all the attention that ‘New’ is getting, the reviews are in: it’s a hit! Songs receiving special attention include the title track, “On My Way to Work” and “Queenie Eye”. The Guardian gives New 3 out of 5 stars. Categories: New Beatles merchandise, Reviews | Tags: cd release, New, Paul McCartney, Queenie Eye, review | Permalink. Apple Corps announced today that The Beatles will release a new two-disc CD set ‘On Air – Live at the BBC Volume 2‘ on November 11, 2013, almost 20 years after Volume 1 came out. ‘On Air’ features 63 live recordings, none of which overlap with The Beatles’ first BBC release. According to the press release, ‘On Air’ includes 37 previously unreleased performances and 23 previously unreleased recordings of in-studio banter and conversation between the band’s members and their BBC radio hosts. The Beatles appeared on various BBC radio shows including Saturday Club and Easy Beat. In June 1963, The Beatles got their own BBC weekly radio show called “Pop Go The Beatles.” Between March 1962 and June 1965, the BBC broadcast 275 unique musical performances by The Beatles in the U.K.
Also included for the first time are the Beatles’ candid interviews for the Pop Profile series recorded in November 1965 and May 1966. Along with the Volume 2 release, a remastered reissue of The Beatles ‘Live at the BBC’ (Volume 1) is also being released in 2013. When Volume 1 was originally released in 1994, it sold 5 million copies in the first six weeks reaching number one in the UK and number three in the US. Also being released is the book, The Beatles: The BBC Archives: 1962-1970 by producer Kevin Howlett who compiled and researched the CD set along with Mike Heatley. The booklets for both collections include Kevin Howlett’s essays on the history of The Beatles’ BBC radio sessions and his detailed commentaries on all of the tracks. Categories: Beatles News, New Beatles merchandise | Tags: beatles, beatles remastered, cd release, live at the bbc, on air, volume 2 | Permalink.